The 2016 CIBC Canada Russia Series is underway in North Bay and Hamilton this coming week as the OHL’s best clash with Russian National Junior Team hopefuls. 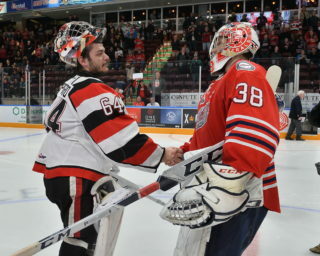 Don’t miss this, and much more as we take you around the OHL This Week. The 2016 CIBC Canada Russia Series comes to North Bay and Hamilton as Team OHL takes on Russia. Game 3 of the six game series is set for Thursday night in North Bay at 7pm before the series shifts to the FirstOntario Centre in Hamilton for Game 4 on Monday at 7pm. Thursday’s game in North Bay can be seen live on Sportsnet ONE while Monday’s game from Hamilton will be aired across the country on Sportsnet. For more information, please visit chlcanadarussia.ca. Nattinen is also the OHL’s representative in #CHLShowdown featuring one great play from all three leagues giving fans the opportunity to vote for their favourite. Check them out and vote at chlshowdown.ca. Wolves stay busy in the community: The Sudbury Wolves had a busy day Sunday, not on the ice, but in the community. Members of the Wolves participated in three different community events throughout the day including the Easter Seals Bowl with the Wolves, GO21 Sudbury Walk for Down Syndrome Awareness and a Youth Crime Prevention Week kickoff with the Greater Sudbury Police. For more information on their Sunday outing, visit sudburywolves.com. 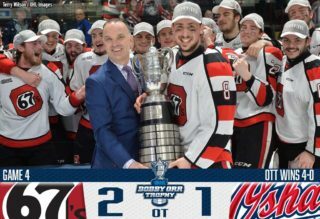 67’s Movember campaign underway: The Ottawa 67’s are raising money for a good cause as Ben Fanjoy leads the way in an early Movember fundraising tally. Fanjoy has raised $210 of the club’s $410 total thus far. Fans interested in contributing to the 67’s’ Movember fund can do so at Movember.com. Firebirds host Military Appreciation Night on Friday: All veterans and active duty military service people will receive a free ticket and a merchandise discount on Friday night at the Dort Federal Event Center as the Flint Firebirds host Military Appreciation Night. For more information, visit flintfirebirds.com. IceDogs don Remembrance Day jerseys on Friday: The Niagara IceDogs salute our troops on Friday, suiting up in camouflage for Remembrance Day when they play host to the Barrie Colts. The IceDogs are also extending a complimentary ticket offer to any active or retired military member in the Niagara Region. For more information, visit niagaraicedogs.net. Greyhounds host Armed Forces Night on Friday: The Soo Greyhounds host Armed Forces Night at the Essar Centre on Friday as they salute our troops on Remembrance Day. The Greyhounds will wear special commemorative Remembrance Day jerseys to be auctioned off post-game. Proceeds from the auction will go towards the Veterans Program Branch 25 and Veterans Commemorative Monument Project in the Soo community. Spirit host Guns N’ Hoses Charity Classic on Saturday: The Saginaw Spirit host the 10th anniversary game of the Guns N’ Hoses Charity Classic on Saturday prior to their matchup against the Peterborough Petes. The police take on the firefighters to raise money for a good cause. 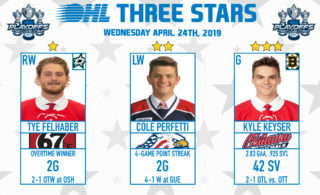 For more information on the game, please visit saginawspirit.com. Kurtis Foster, Julia Tanner to chair 2017 Petes Pink in the Rink Campaign: Peterbrorough Petes assistant coach Kurtis Foster and longtime Petes fan, billet and community member Julia Foster will chair the team’s 2017 Pink in the Rink Campaign. The initiative looks to raise $85,000, which will bring the eight year campaign total to over $540,000. Once again this year, a special jersey design has been created to honour those affected by cancer. For a donation of $20 to the Canadian Cancer Society, the Petes will print the name of someone who has or continues to battle cancer, or who lost a fight to cancer, on each jersey. The campaign concludes with the Pink in the Rink game on Saturday, February 4 at 7:05pm against the Oshawa Generals. For more information, visit gopetesgo.com. Gemel Smith scores first NHL goal: Former Owen Sound Attack and London Knights forward Gemel Smith scored the first two goals of his NHL career on Sunday as the Dallas Stars fell to the Chicago Blackhawks 4-3 in overtime. Smith scored goals in the second and third periods, with the first of his NHL career coming shorthanded on an impressive effort. Smith, who was Dallas’ fourth round (104th overall) pick in 2012, has spent the past two seasons with the Stars’ AHL affiliate in Cedar Park, Texas. In seven NHL games this season, Smith has two goals, an assist and three points. The older brother of Guelph Storm forward Givani Smith played four OHL seasons from 2010-14, winning an OHL title with the Owen Sound Attack in 2011 before playing in a Mastercard Memorial Cup with the London Knights in 2014. He recorded 89 goals, 114 assist and 203 points over 264 career regular season games. Anthony DeAngelo scores in NHL debut: Former Sarnia Sting and Sault Ste. Marie Greyhounds defenceman Anthony DeAngelo made his NHL debut with the Arizona Coyotes on Tuesday, scoring a goal in their 4-2 win over the Colorado Avalanche. DeAngelo tied the game 2-2 in the second period with assists from Max Domi and Anthony Duclair. The former first round pick of the Tampa Bay Lightning in 2014 played in 69 games with the AHL’s Syracuse Crunch last season, recording six goals, 37 assists and 43 points before being dealt to Arizona over the offseason. DeAngelo played four OHL seasons with the Sting and Greyhounds from 2011-15 suiting up in 236 career regular season games while amassing 55 goals, 186 assists and 241 points. He was the CHL’s Defenceman of the Year in 2015. Red Wings recall Tyler Bertuzzi: Guelph Storm graduate Tyler Bertuzzi has been summoned by the Detroit Red Wings. The Sudbury, Ont. native has four points (2-2–4) over nine games with the AHL’s Grand Rapids Griffins this season, after spending his rookie season in the AHL last year. Bertuzzi was a second round (58th overall) pick of the Red Wings in 2013. 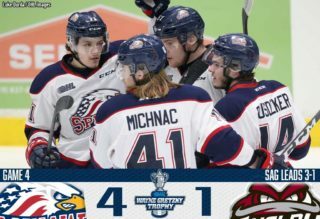 The nephew of former Storm great Todd Bertuzzi won an OHL title with Guelph in 2014, finishing his four-year OHL career with 72 goals, 100 assists and 172 points over 201 regular season games. Rick Nash scores 400th NHL goal: London Knights graduate Rick Nash scored his 400th career NHL goal on Tuesday as the New York Rangers fell to the Vancouver Canucks 5-3. The 32-year-old Nash is currently in his 14th NHL season and has recorded 400 goals, 343 assists and 743 points over 936 regular season games. He was the first overall pick by the Columbus Blue Jackets in the 2002 NHL Draft. Nash played two seasons in London, being named OHL Rookie of the Year in 2001. He registered 63 goals, 75 assists and 138 points over 112 career OHL regular season games. Jordan Staal plays 700th NHL game: Peterborough Petes graduate Jordan Staal registered an assist in his 700th career NHL game on Sunday. The Carolina Hurricanes centreman has played in 11 games this season, recording three goals, an assist and four points. The 28-year-old began his NHL career as an 18-year-old with the Pittsburgh Penguins in 2006-07 after winning an OHL title with the Peterborough Petes in 2006. Staal, who was Pittsburgh’s third overall pick in the 2004 NHL Draft, won a Stanley Cup title with the Pens in 2009. In his two seasons with the Petes from 2004-06, the Thunder Bay native registered 37 goals, 59 assists and 96 points over 134 regular season contests. Fedor Tyutin records 200th NHL assist: Guelph Storm graduate Fedor Tyutin recorded his 200th career NHL assist with the Colorado Avalanche on Sunday. The 33-year-old has played 810 career NHL games dating back to 2003-04 when he broke in with the New York Rangers after being a second round (40th overall) pick in 2001. Tyutin played one season with the Storm, recording 19 goals, 40 assists and 59 points over 53 games in 2001-02, being named to the CHL’s All-Rookie Team. He won World Junior gold with Russia that same year and helped the Storm host the 2002 Mastercard Memorial Cup. Taylor Beck named AHL Player of the Week: Guelph Storm graduate Taylor Beck has been named the AHL’s Player of the Week after compiling three goals, five assists and eight points over three games with the Bakersfield Condors. Currently in the Edmonton Oilers system, Beck has totaled 64 goals and 113 assists for 177 points in 251 career AHL games with Bakersfield, Bridgeport, San Antonio and Milwaukee, as well as 11 goals and 12 assists in 88 National Hockey League contests with Edmonton, the New York Islanders and Nashville. He was Nashville’s third round (70th overall) pick in 2009 after a four year career with the Storm from 2007-11. He recorded 110 goals, 157 assists and 267 points over 246 career OHL regular season games. Be sure to catch all of this weekend’s action at ohllive.com!